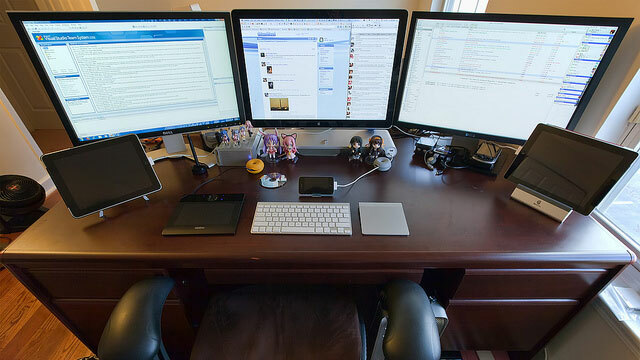 Today's featured workspace packs three screens, multiple touch devices and Nendoroid Japanese figurines on one desk. Flickr user saebaryo's desk setup is an update from his 2010 workspace. Here he has two Dell 24-inch monitors plus a 24-inch Apple Cinema display; rotating the monitors to portrait orientation helps maximises space, as we've seen before. One could ask why, i could purchase 10screens and 20 tablets but at some point..
Why the hell would anyone need more than 1 tablet? Can't get behind the small screen and no real mouse. Big points for the three big screens though. The more screen real estate the better! Screen on the brain. Small keyboard. Don't like the small keyboard. I might pile everything on my study desk and take a photo. Would two cats count as dual wrist rests? I'd like to see a video of all this in use... I'd like to know what one could possibly be doing that would take advantage of all that. That'd be some crazy p0rn!